At Purdue we had to take cooking labs as part of the Hospitality major. In the labs we worked in a mock restaurant where everyone was assigned roles that lasted the whole semester. 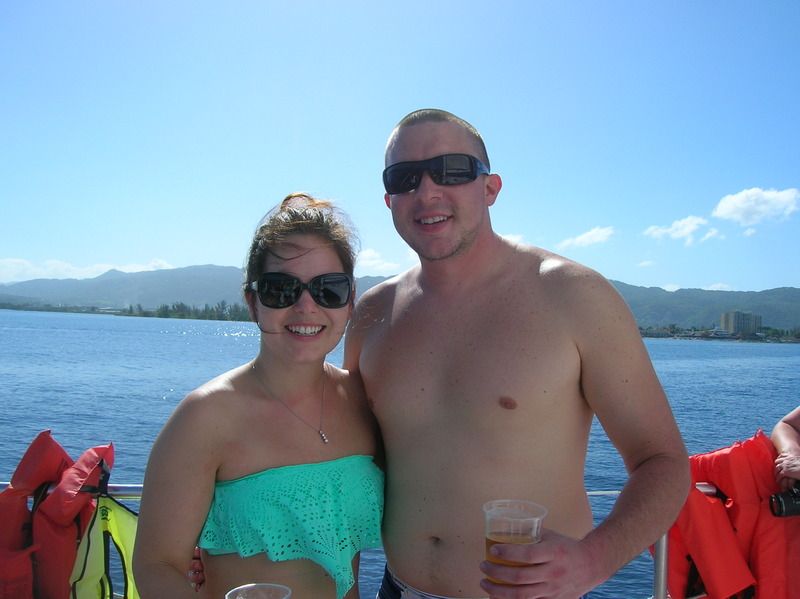 I don’t know how they assigned us to the roles because we didn’t answer any questions about what we liked or where we had experience, but there always seemed to be a system to it. 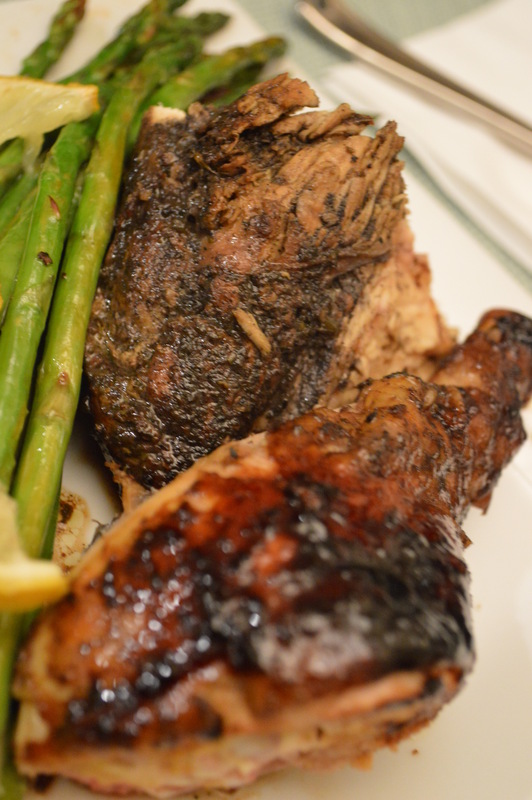 Students with restaurant backgrounds were put on the line, cooking the entrees. People with strong, bossy personalities were expediters, inspecting every plate before it went out to a customer. Pretty girls, who wanted to be wedding planners or in sales, were servers and would spend the lab learning new napkin folds. People who didn’t want anything to do with restaurants and the food industry were put on the dish washing machine… and they hated the lab. It wasn’t a hard system to crack. And, for some reason, I was always put in charge of desserts. I think the reasoning there was: She’s in a sorority and has a cute face but a little chub. She must like to bake. 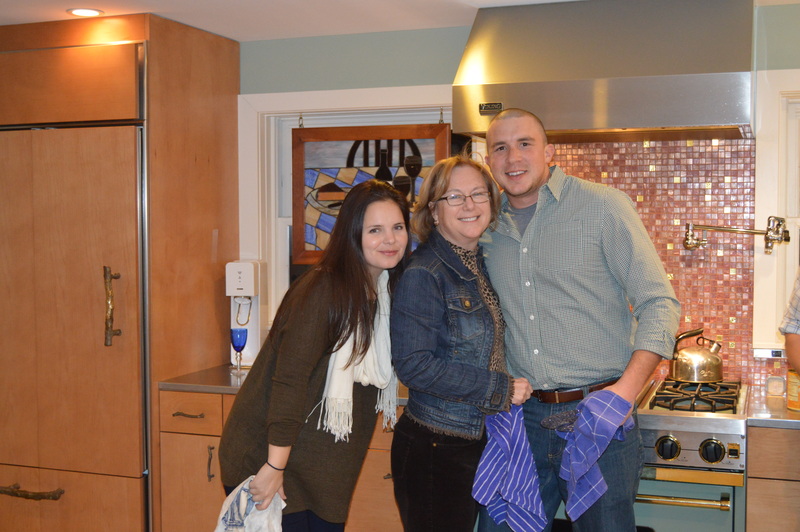 At eighteen only real kitchen experience I had was baking with my mom at home. So the system hit the nail on the head. Too this day I still like to make desserts, I just try not to do it often as I have this problem where everything sweet and wonderful tends to go to my behind. Does any one else suffer from this crazy phenomenon? But, if I had to pick a favorite dessert to make it is hands down ice cream. We got an ice cream maker for our wedding and I love it. It is such a neat tool and makes ice cream making super easy. I have made sherbets, herb infused ice creams and more. I decided that I wanted to make ice cream this weekend because I wanted to try the ginger syrup from the trip to Atlanta. The grower at the farmer’s market mentioned it is great drizzled over vanilla ice cream. Vanilla ice cream is ridiculously easy to make. There are a whopping four ingredients in it versus the, like, forty in the ice cream at the store. Best of all, it has this great, creamy, authentic flavor. 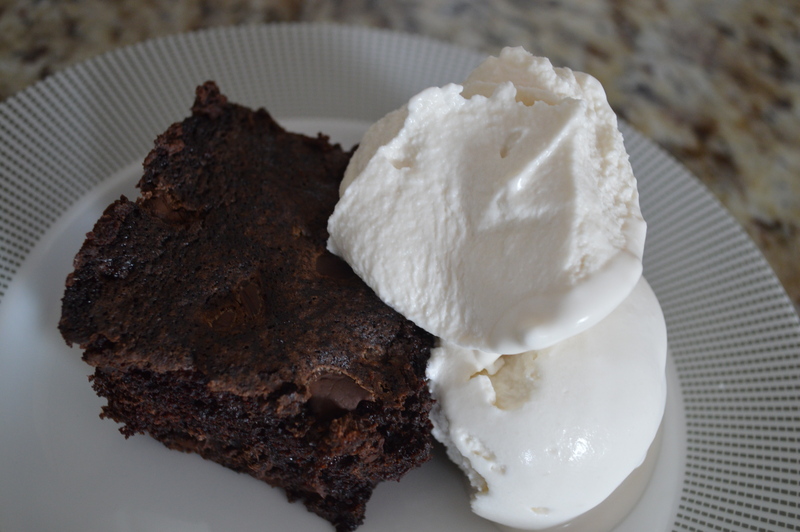 As I dug through my pantry to find the vanilla extract, I thought about what also goes great with cold vanilla ice cream: Warm, fresh baked brownies. 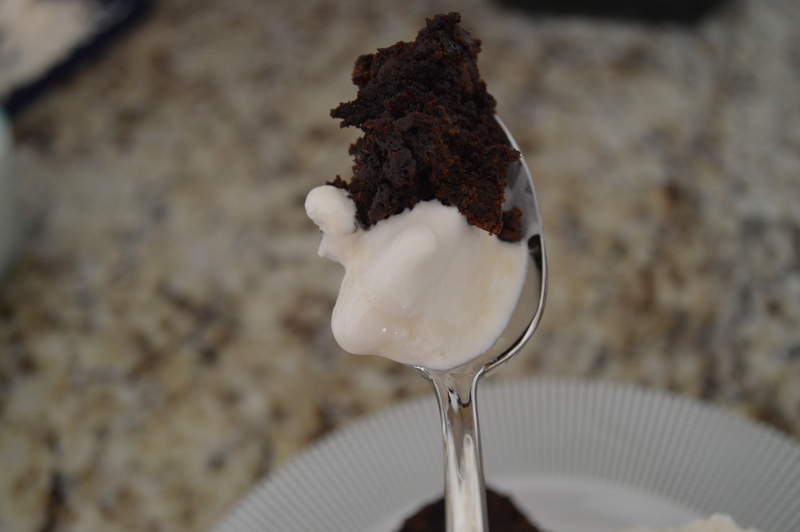 Get ready for dessert overload because in this post I have my super easy vanilla ice cream recipe and a great chocolate zucchini brownie recipe using some of last summer’s frozen zucchini. And in the spirit of full disclosure, the ginger syrup was excellent on the fresh made ice cream. 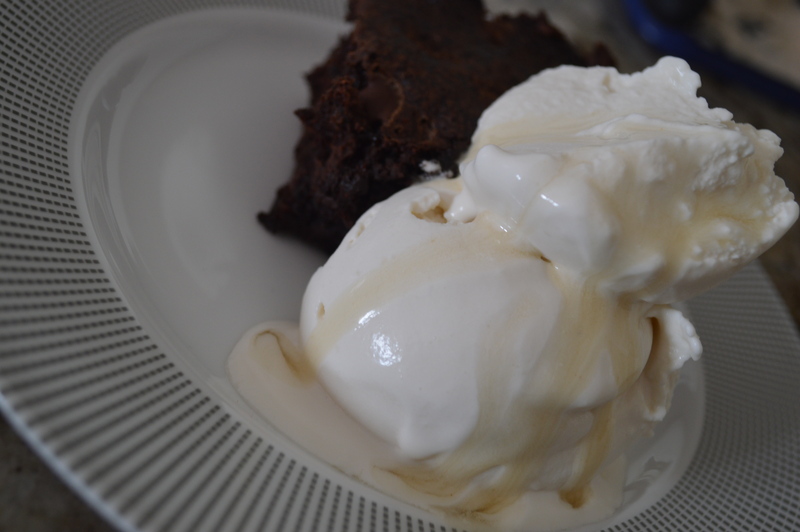 The gingery bite of the syrup on the cool, creamy vanilla ice cream elevated my basic vanilla ice cream to a ten. Use a hand or stand mixer to combine milk and sugar in a medium sized bowl. Mix until sugar is dissolved, about three minutes. Mix in heavy cream and vanilla. 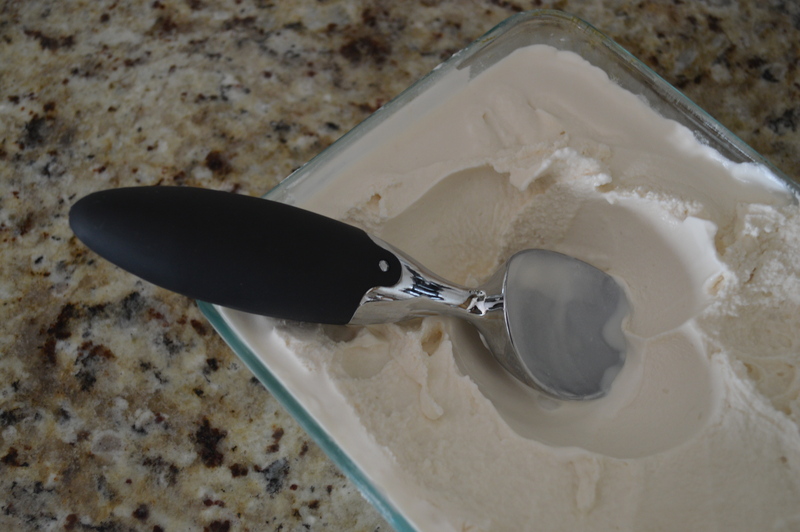 Pour mixture into the ice cream maker’s chilled freezer bowl. Mix for about 25 minutes. 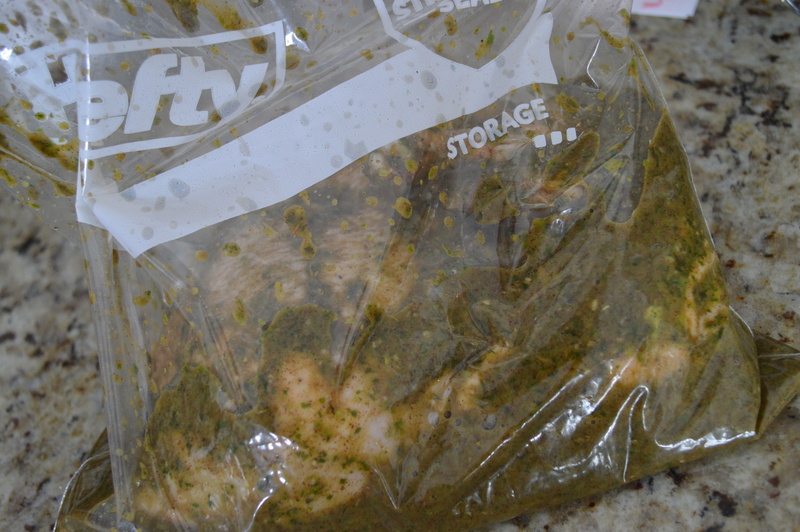 Transfer to a container and freeze for at least two hours before serving. 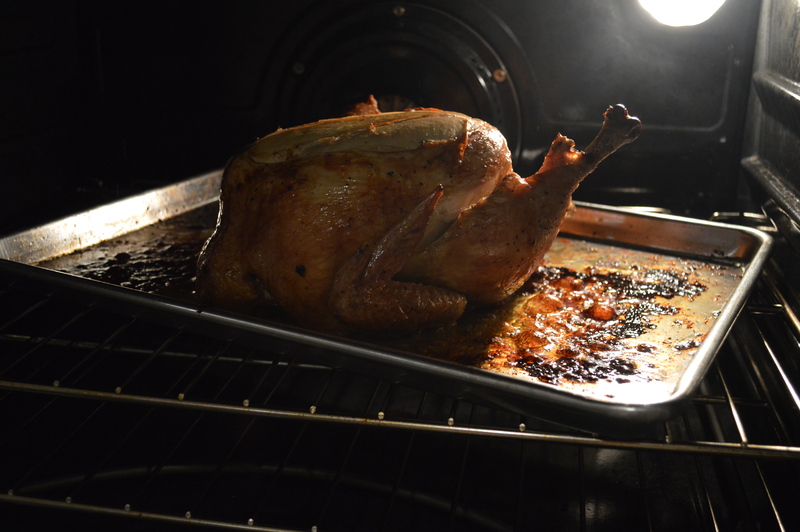 Spray an 8×8 baking pan with non-stick cooking spray. In a large bowl, whisk together eggs, zucchini, vanilla, sugar, butter and salt until combined. Stir in flour, cocoa powder, baking soda, cinnamon, and allspice. Just combine. Add chocolate chips and mix until incorporated. Pour batter into baking pan. 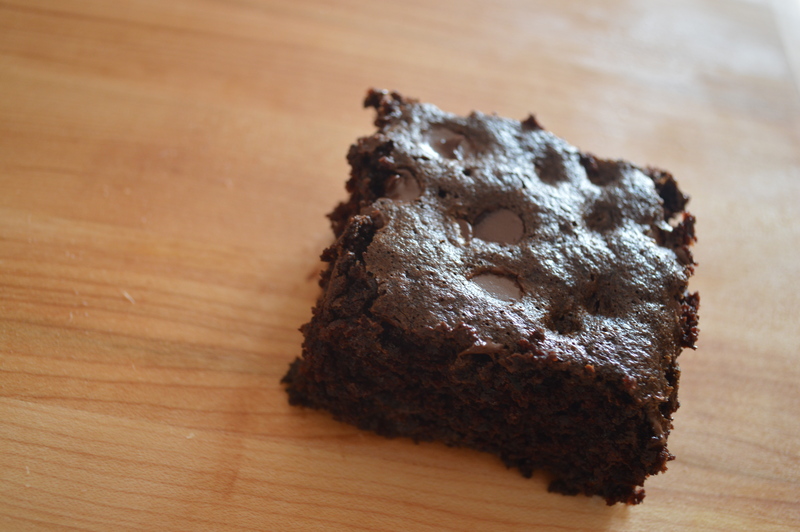 Top with a handful of chocolate chips. Bake for about 40 minutes or until the center is cooked through. … In defense of my super decadant afternoon snack, I also planted a whole flat of lettuce today. It’s all about balance, right?! Uh, yeah. If you need me, you can find me at the gym. During our visit to my parent’s home in Michigan earlier this month, my mom took Adam and me to Holland’s Farmer’s Market. Holland is about twenty five minutes away from my parent’s house and is a really neat little town. The Farmer’s Market/dish crew…. got to love family dinners. Holland is home to Hope College, where my little brother is a freshman and a strong backstroker on the swim team. The community plays up the connection to the country, Holland. It is decorated with traditional windmills and hosts a Tulip Festival each spring. There are also a bunch cute boutiques and unique restaurants that I cannot wait to check out on a future visit. But, it is clear the town value’s the farmers market. A whole street is set up for the market which is open twice a week from May to December. And even during the first weekend in December, the market was full of produce, baked goods and beautiful Christmas décor. One vendor was offering a deal where you could fill a large department store bag full of any root vegetables of your choice. Adam and I took him up on this offer and filled our bag with Red, Yukon and Sweet Potatoes, lots of carrots, yellow and red onions, beets, and a celery root. 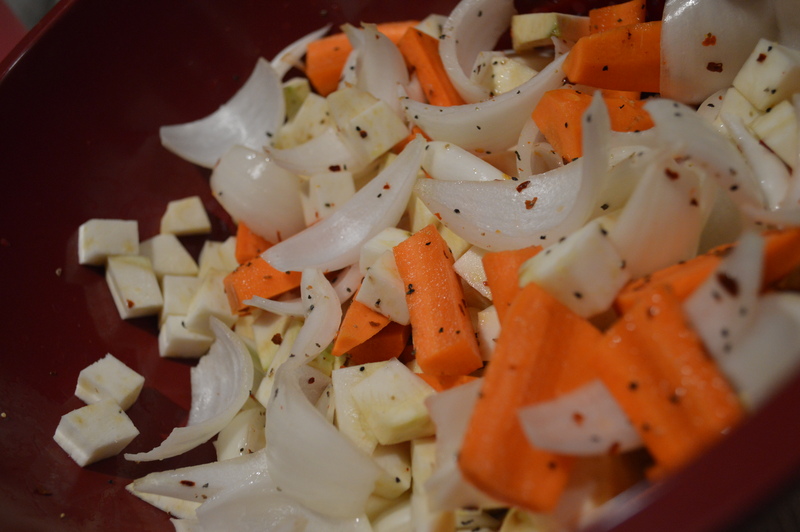 The following are recipes showing what we did with some of these great root vegetables. I love Terra Chips. If I buy a bag, it rarely makes it into my home unopened because I always seem to “need a snack” on my drive home. But, I hate how they are so expensive. 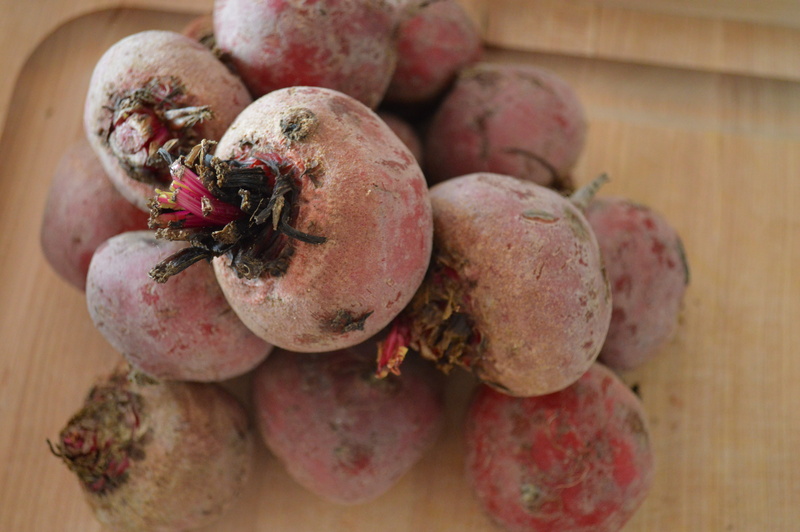 So, using some of my beets, sweet potatoes, and Yukon potatoes from the Holland Farmer’s Market, I decided to make my own. They were great and really easy. 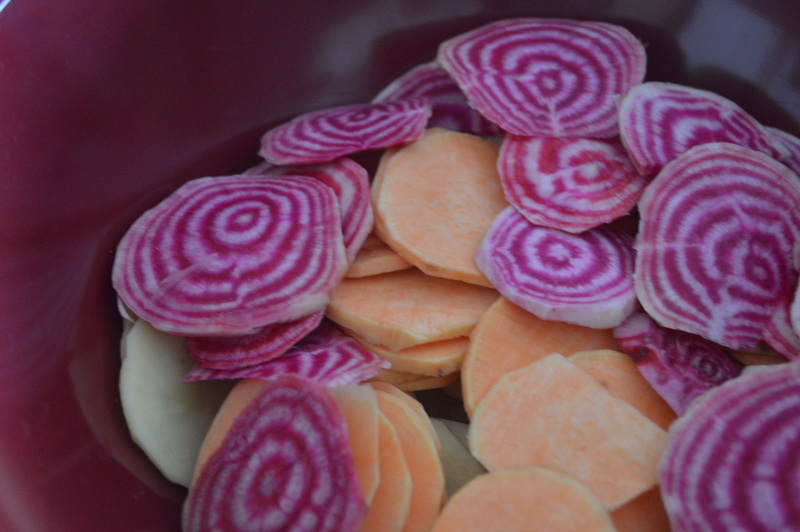 The beet chips were sweet and balanced the more savory flavors of the potatoes. Slice all veggies ¼ inch thick. I used my mandolin. Toss sliced vegetables with oil. 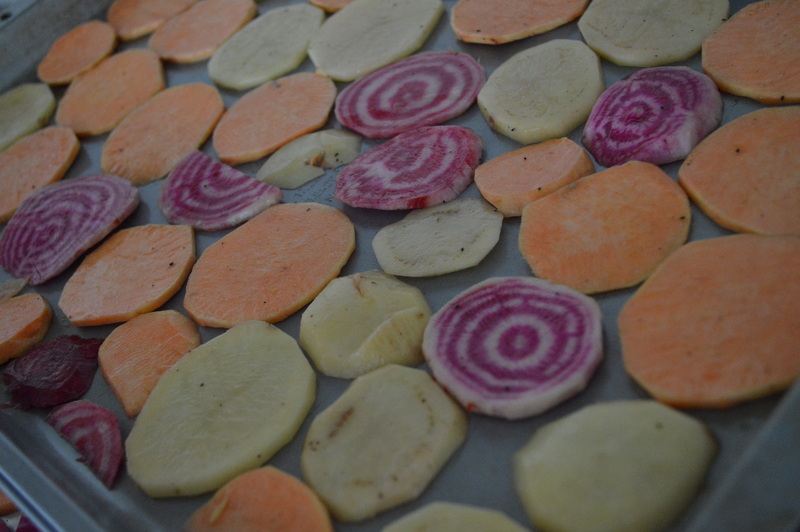 Lay vegetables on a large cookie sheet. Bake for thirty minutes and place on a cooling rack. Chips will continue to harden as they cool. I recently was asked what my favorite thing to cook is. And honestly, I was stumped. I love to cook. 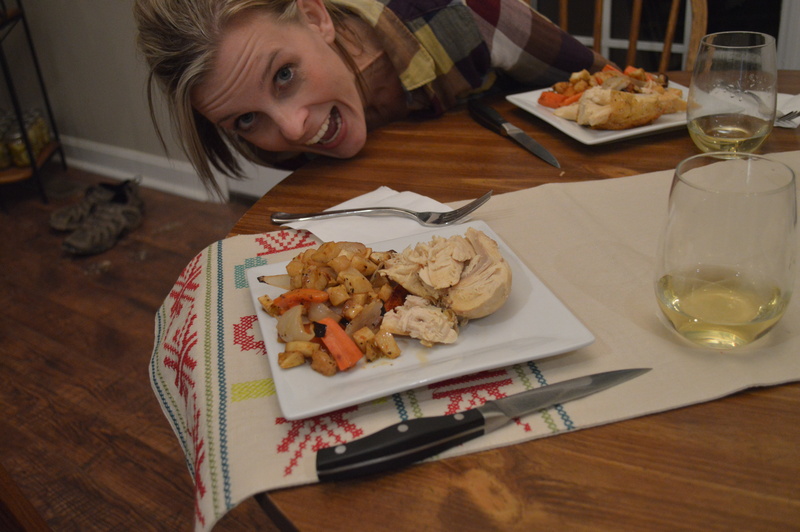 Eggs, dessert, breads, vegetables, large roasts, soups, stir fry’s, homemade pizza… I could go on and on. 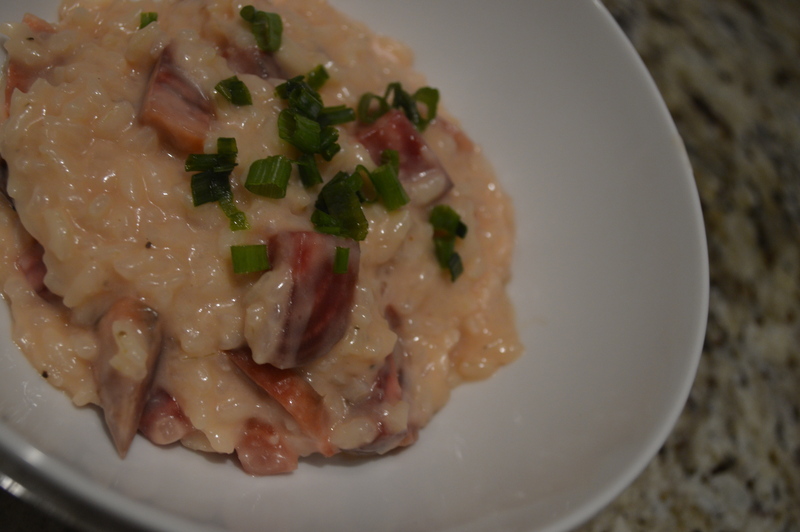 Then, it came to me at work when I was assisting a chef at my Alma Mater: I love to cook risotto. I came to this discovery while cooking risotto for eighty sorority women. Even though the muscles in my shoulders burned from stirring the massive amount of Arborio rice, I knew this was my love. It’s great anytime of year, but there is just something so cozy about it when it’s chilly outside. It is also so versatile. 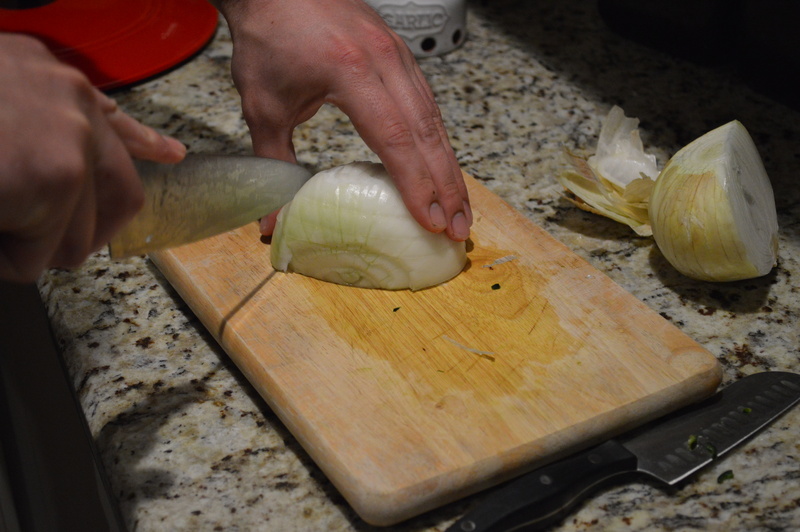 Risotto prep starts the same every time, but you can add all sorts of ingredients towards the end to make it your own. My mom often adds parmesan and scallops. That evening on campus we added coconut milk and toasted coconut flakes to the risotto as it served as an accompanist to some island style chicken. I was searching for something to do with our farmer’s market beets other than roasting them and through my searching, found that goat cheese pairs great with the sweetness in the beets. Inspired by my risotto at the sorority, I thought it could be a great combination. 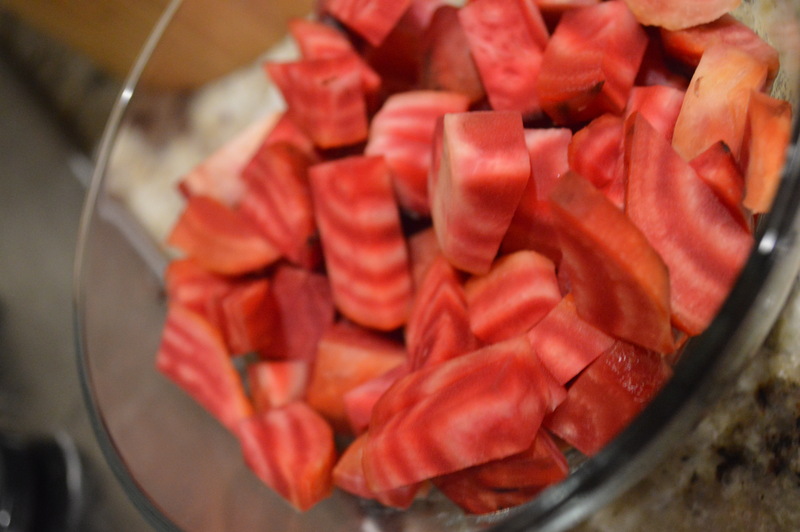 Rinse any dirt off beets, pat dry. 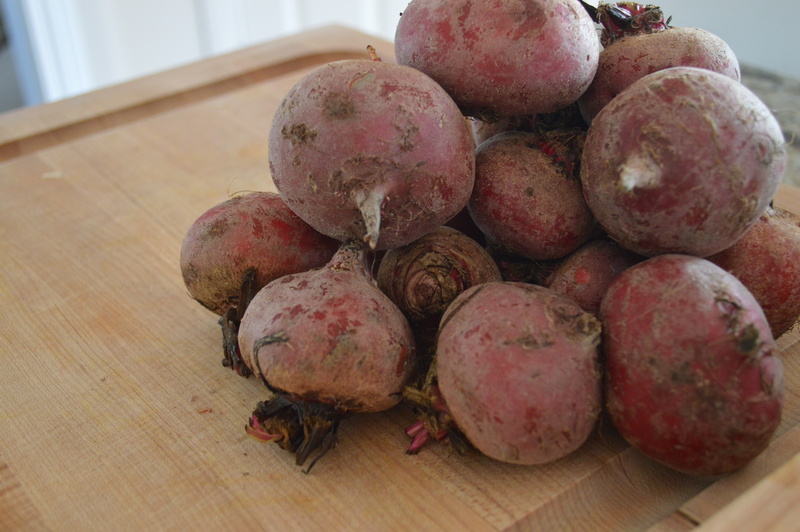 Roast Beets for 40 minutes. Easy way to do this is just place on a sheet of foil. 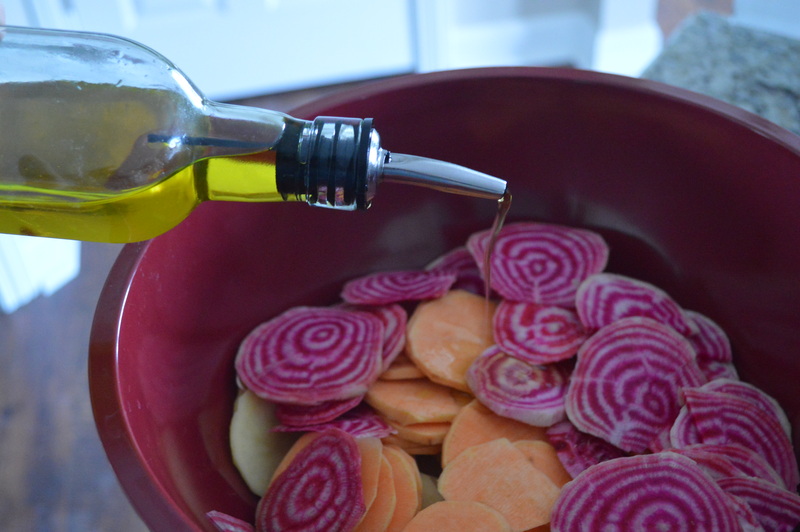 Doesn’t hurt to drizzle a little olive oil on the beets. 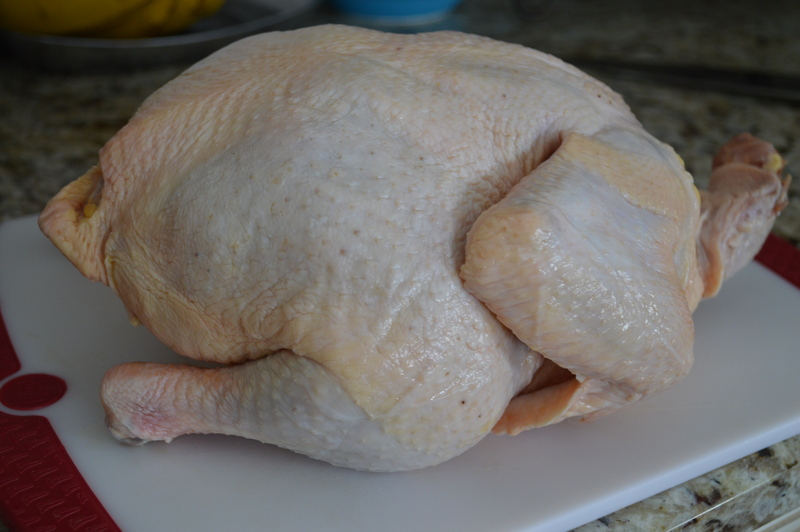 Once complete, let cool and remove skin. Cut into ½ inch pieces. Heat up stock in a sauce pan. You want the stock just to steam, not boil. 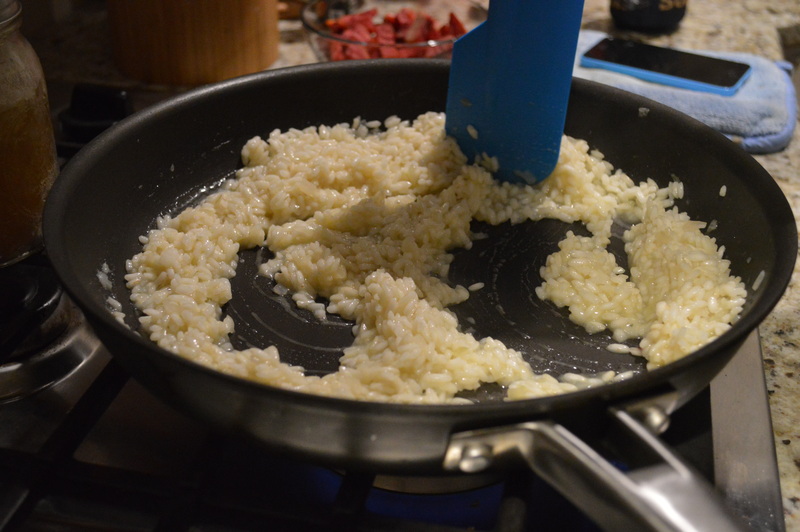 In a large, high sided skillet (We have found our wok works better than a skillet… I had forgotten about this when I made this risotto.) heat olive oil on medium high heat. 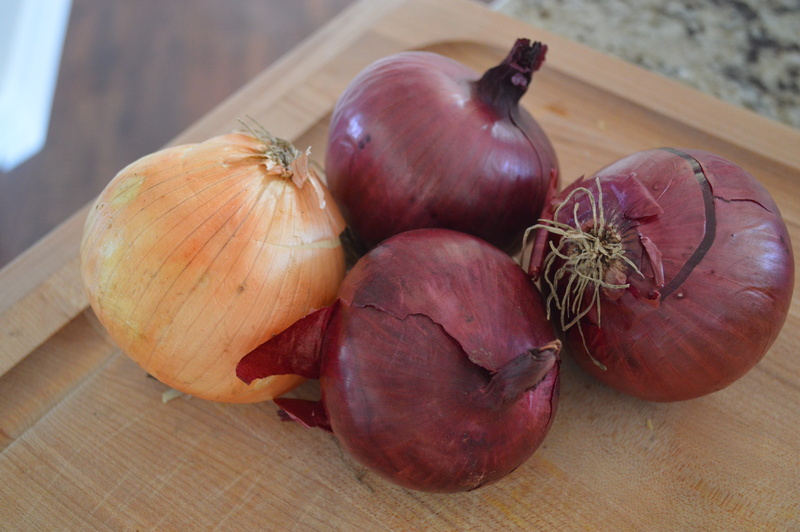 Add the shallots and cook for about three minutes. You don’t want them to brown. Add the rice and stir to coat in the oil. 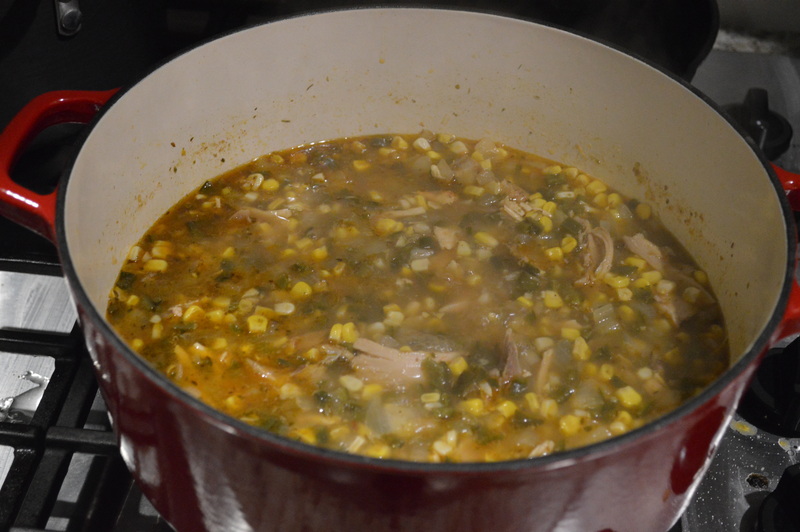 Reduce heat to medium and add a half cup of stock, stir until absorbed. Continue with a half cup of stock at a time until rice is cooked through. Remove from heat and stir in beets, butter, and goat cheese. Top with chopped chives. 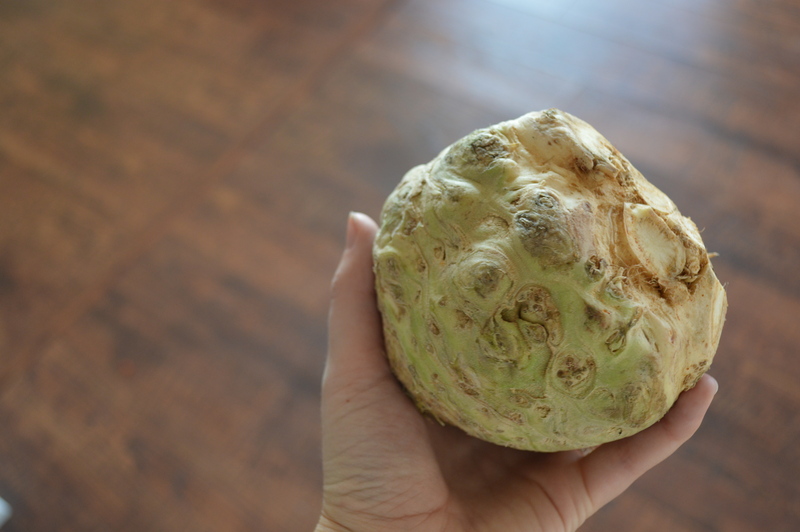 So, the oddball in out root loot was the celery root. 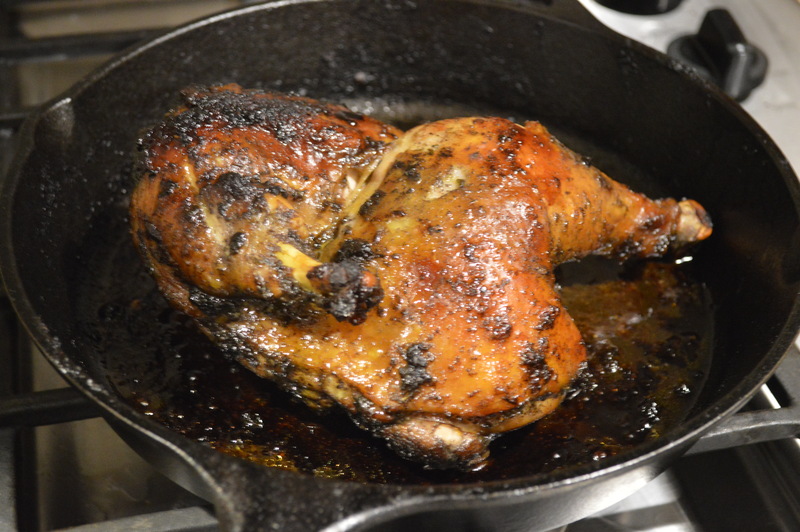 I had never cooked or had one, so we decided if there ever was a good time to give it a try, this was it. It is a weird looking vegetable. And, really, not all that pretty. But, I read that what it lacks in looks, it makes up in flavor. 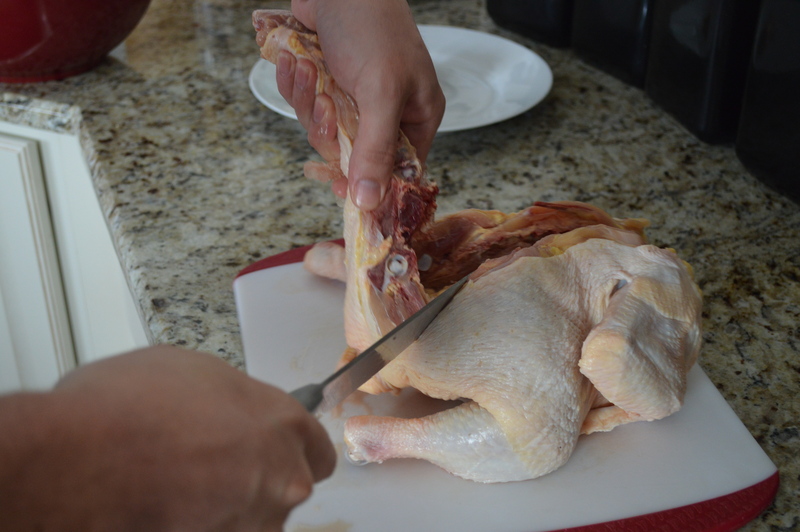 I also read online to prep it you need to remove the skin. I used a vegetable peeler and it worked okay. The skin is a bit thicker than anything on a carrot. 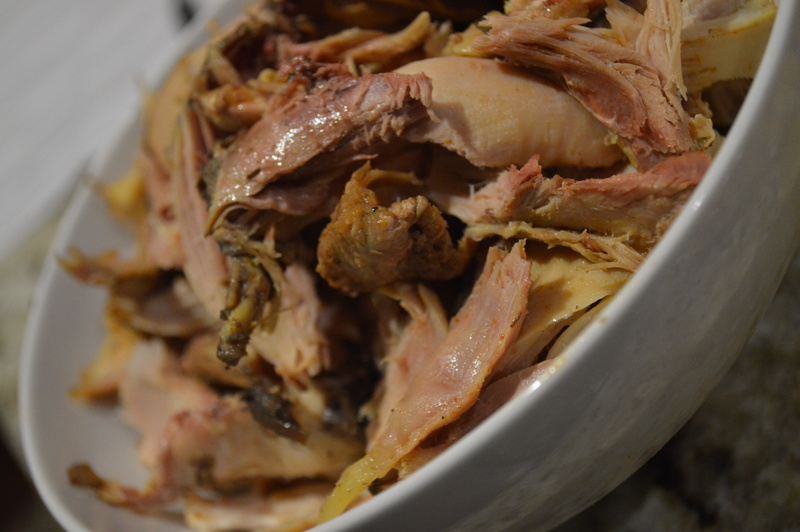 We had just had fifty of our free range chickens processed and we were eager to give them a try. We decided to roast one of the birds so it just made sense to roast some veggies as well. 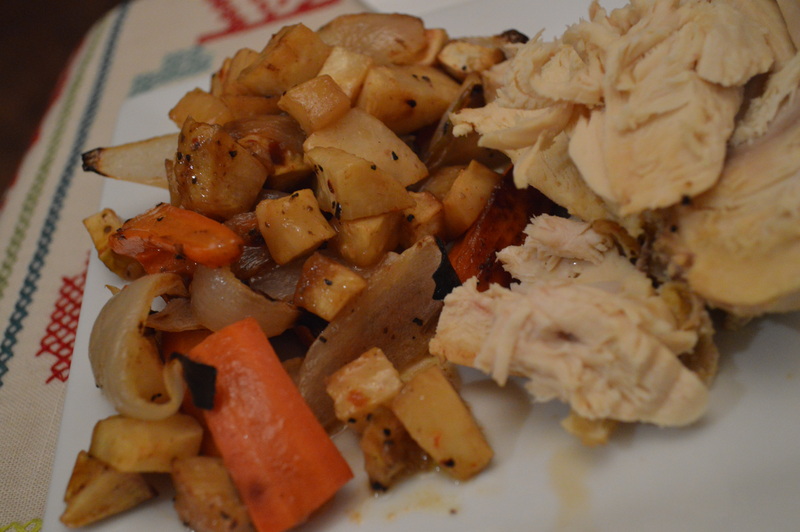 Using a few other of the root vegetables on hand we made a great meal when a couple friends were joining us for dinner. 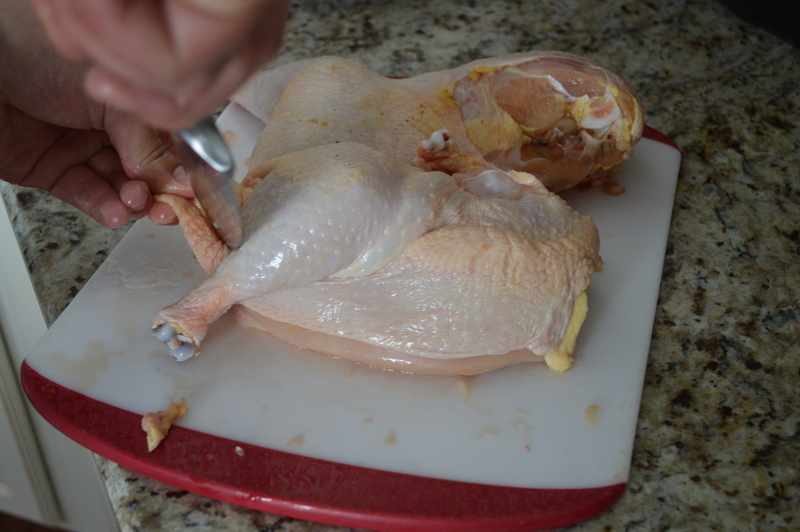 Rub salt and pepper onto chicken. Place on baking sheet and cook for twenty minutes. While cooking, season vegetables with salt, pepper, red pepper flakes and lemon juice. Toss to coat. 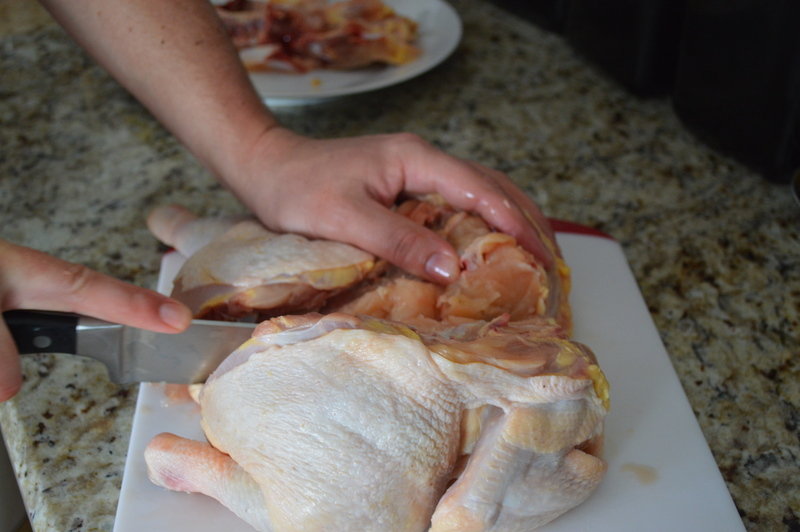 Add vegetables to baking sheet, turning to coat in the chicken drippings. 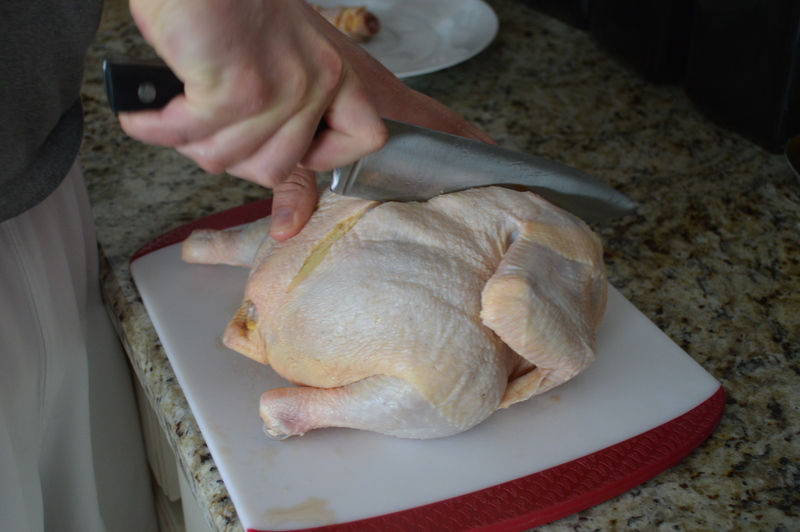 Let chicken rest about five to ten minutes before serving. Pairs well with an oakey Chardonnay… and fun friends. Sweet potatoes seem to be all the rage these days. They are even showing up on menu at fast food restaurants! But, I can’t knock them. They are full of nutritional benefits. For starters? They are a great source of Vitamin C, which is great this time of year because it helps ward off the cold and flu viruses. 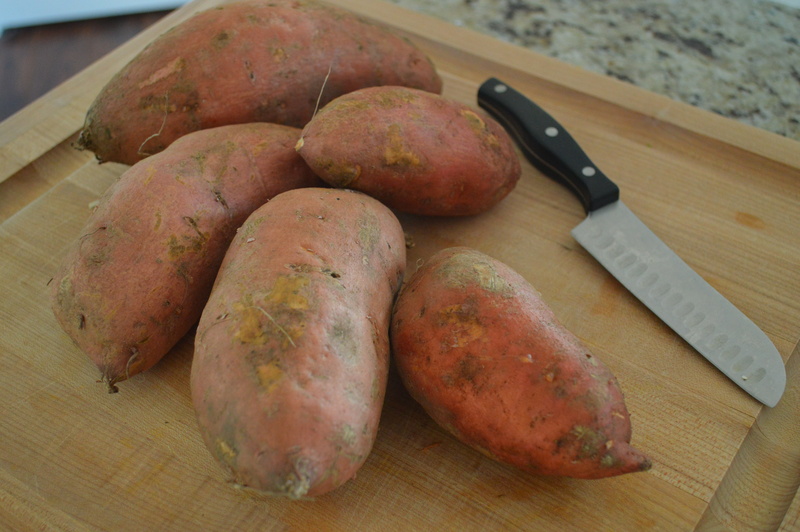 And another reason to eat sweet potatoes this time of year is because they are full of Vitamin D. Which, most popularly, we get from sunlight. Which, also happens to be in short supply as we near the Winter Solstice. So, all those (self diagnosed…) Seasonal Affective Depression Disorder sufferers out there? Sweet Potatoes are for you us. I think sweet potatoes already are pretty sweet, so I wasn’t looking to jazz mine up with brown sugar like they are traditionally done. 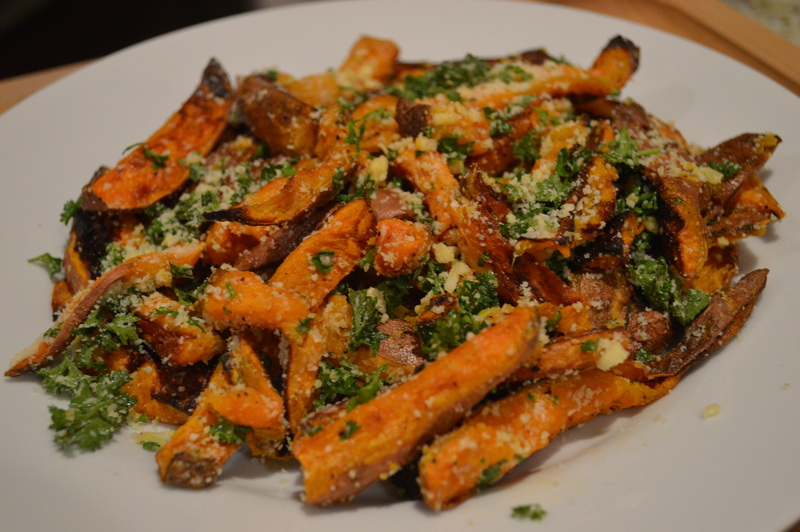 So, I went the savory route with these fries based on a recipe from the Williams Sonoma blog and they were spot on. 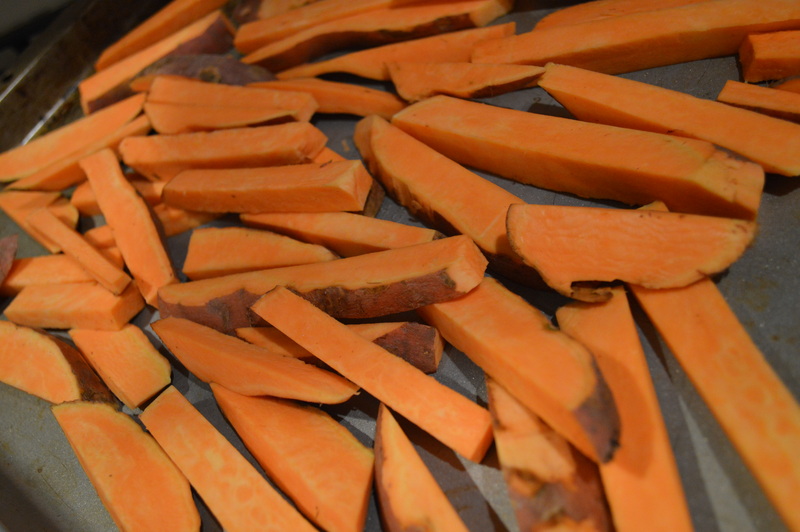 Place sweet potato batons on baking sheet with oil, salt and pepper. Toss to coat. Make sure the potatoes are spread out so that they cook evenly. Roast for about twenty five to thirty minutes, stirring halfway through. You want the potatoes to be tender and a little browned. While roasting, combine parmesan, parsley and garlic in a bowl. Add the warm fries, toss gently to coat. Serve right away. The baby shower was great timing last weekend because I was able to use plenty of produce from the garden. I made a big salad with the mixed greens and just had different toppings and dressings so people could make it their own. 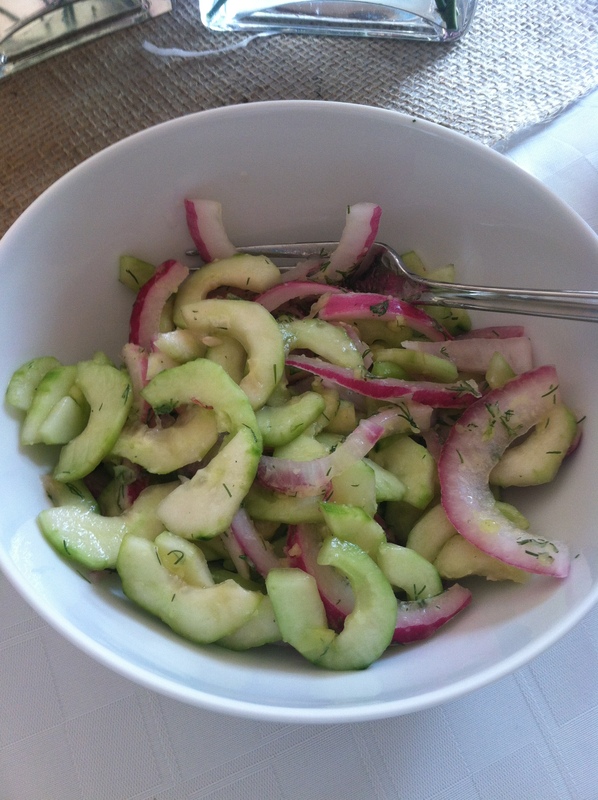 I also prepared this great cucumber salad we have already made multiple times this summer. It’s really simple to make and only requires a few ingredients. That’s always a win for me. 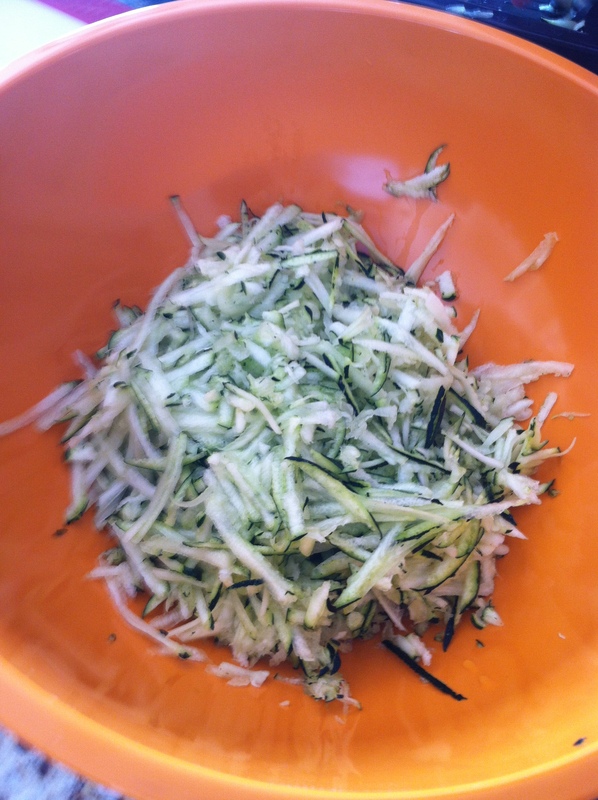 Another recipe that we made for the party is also a go to in the summer is this sautéed zucchini side dish. 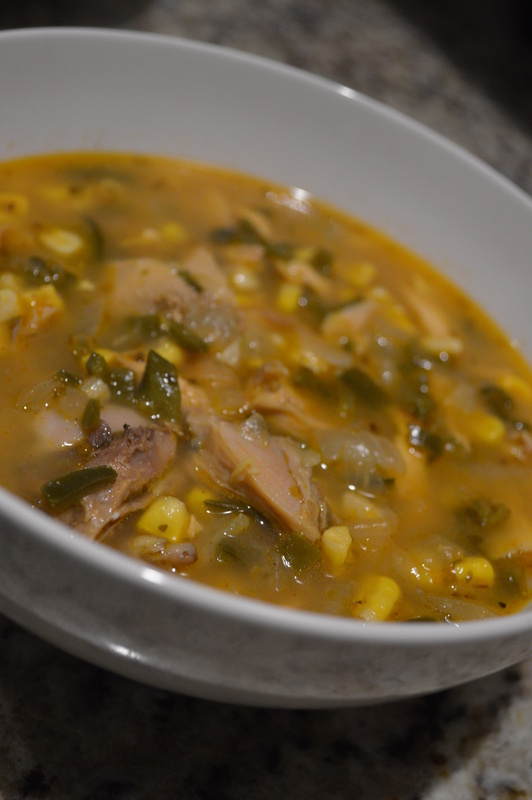 We have been making this recipe for two years now; I pretty much know it by heart. 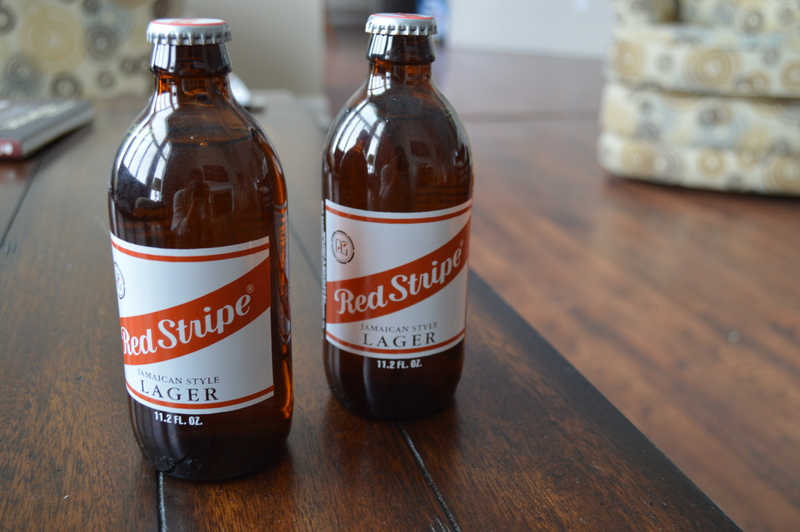 The flavors go together so well and compliment any meal. 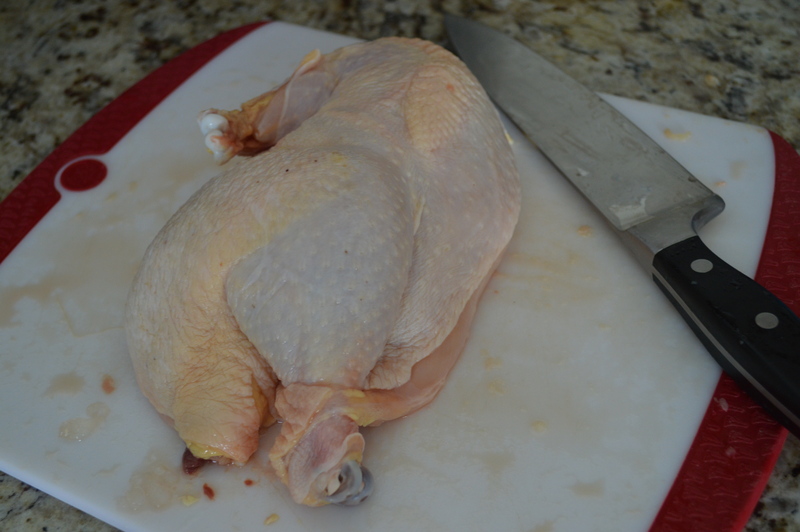 Thanks to the bounty of produce accumulating on my counter top, I decided it was time to do some freezing. 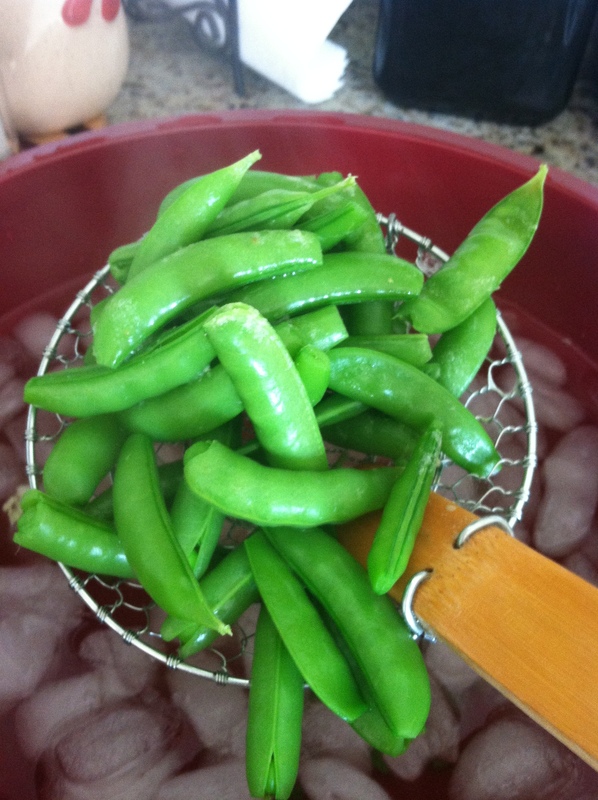 Freezing is a great way to preserve fruits and vegetables and is much simpler than canning. 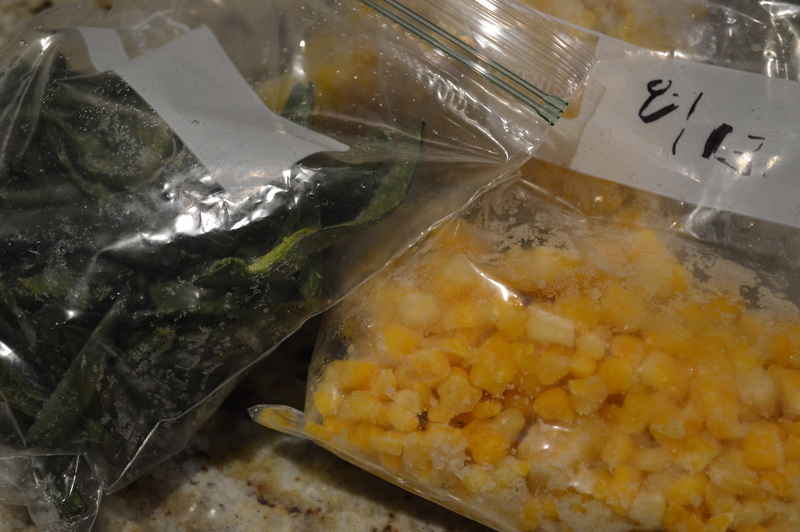 Frozen veggies are good for about twelve months. I, of course, had never done this before, but it really didn’t seem too bad. 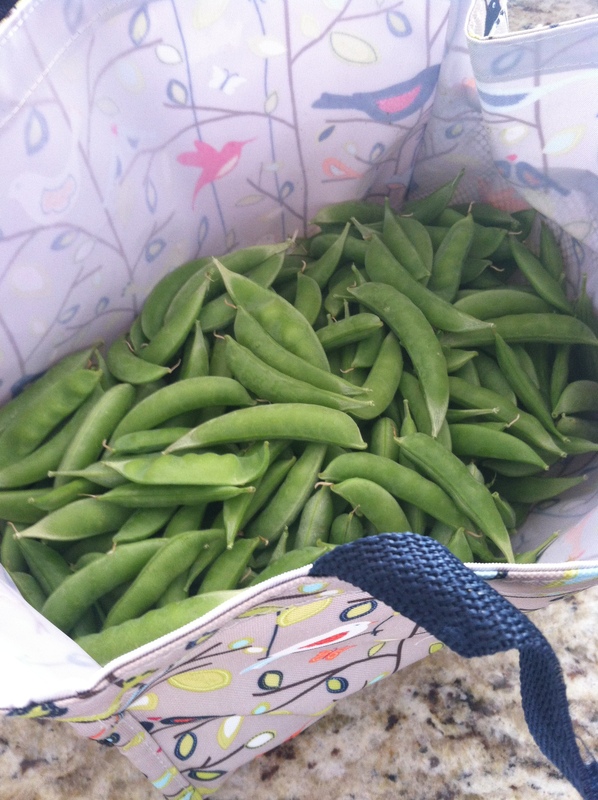 I started with snap beans because ours were towering and full of peas. I have been picking them for about two weeks. They make great additions to salads and even serve as a great snack with some hummus or without. 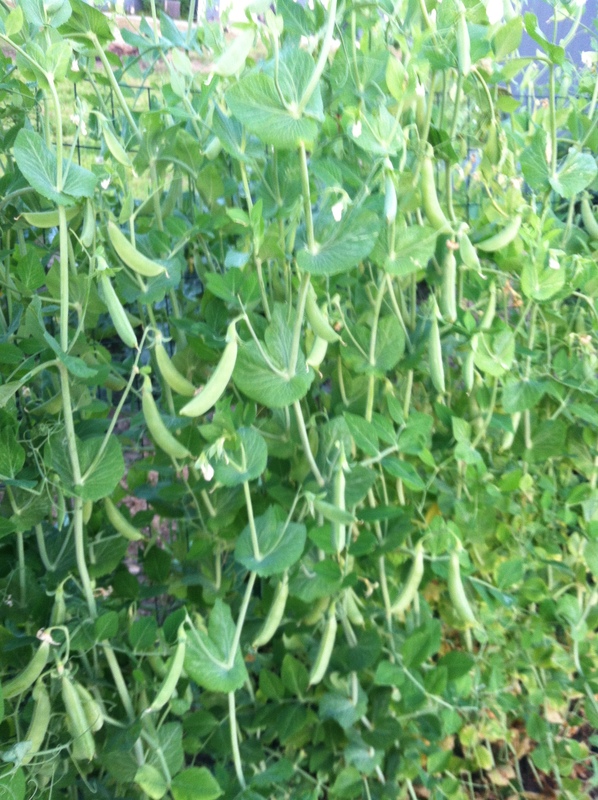 The flavor of these peas has been incredible. After work I spent about thirty minutes picking as many of the larger beans that I could find (…in the massive heat wave that is hitting the Midwest currently) I headed in to get to work in the kitchen. I cleaned and snipped the end of the beans with a knife. Next, I got everything set up to blanch the beans. 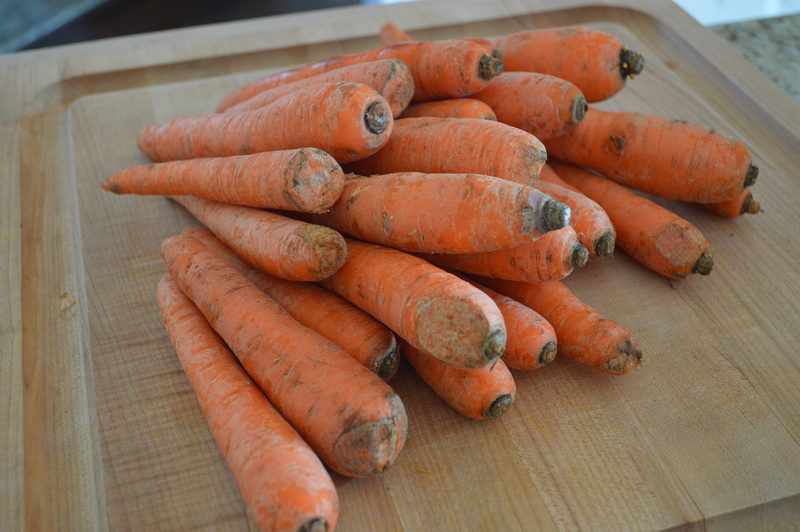 Blanching is when you heat up veggies and then quickly cool them to lock in flavor and nutrients. 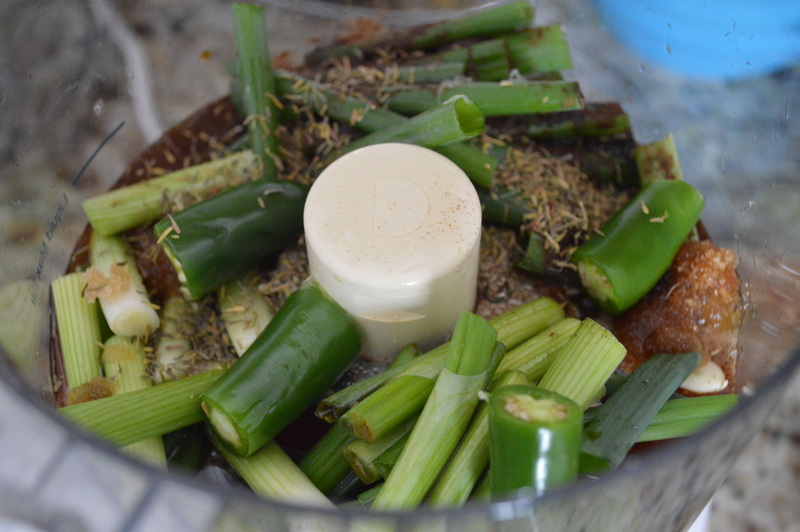 I actually had not blanched anything since lab courses in college, but it is, fortunately, really easy. I set a pot on the stove top to bring to a boil, a big bowl full of ice and cold water, and a cookie sheet lined with paper towels. The beans were put in boiling water for two minutes. I then lifted them with a large straining spoon and dunked them into the ice water. The instant they hit the water they turned a bight, beautiful green, just like I remembered would happen from that early morning lab. The beans were in the ice water for two minutes as well. 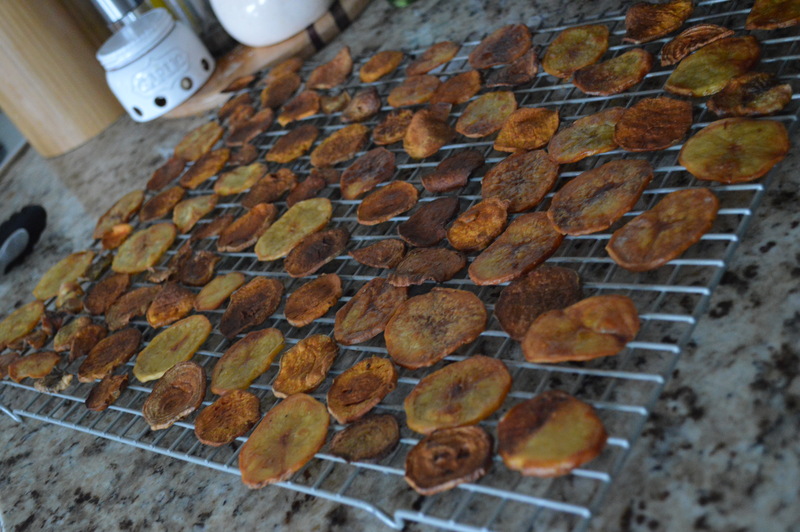 I then strained them out and placed them on the cookie sheets. The paper towels quickly absorbed their moisture. 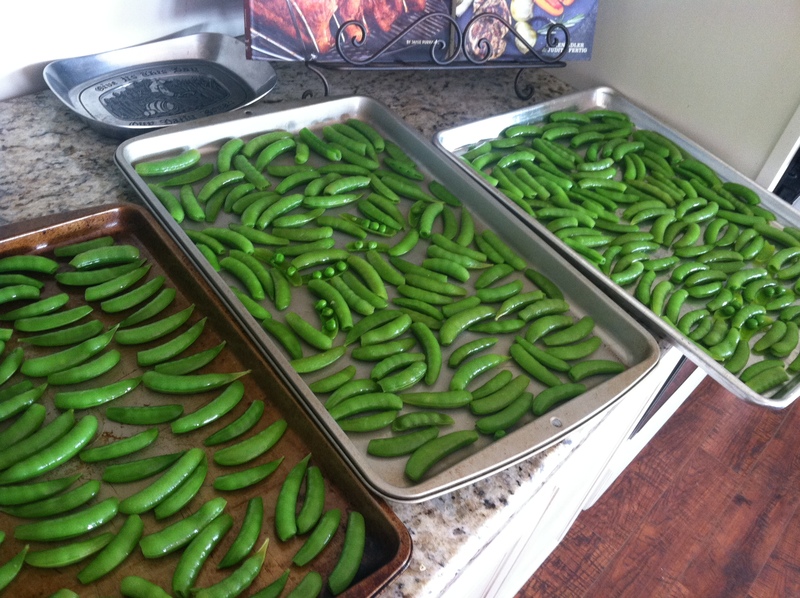 I repeated the process until my many snap beans were blanched and drying on the cookie sheets. I took another paper towel and pressed it on top of them to pick up any remaining water. Next, you can put them directly into a ziplock bag to freeze or you can freeze them on the cookie sheets, then put them in ziplock bags after they had frozen. 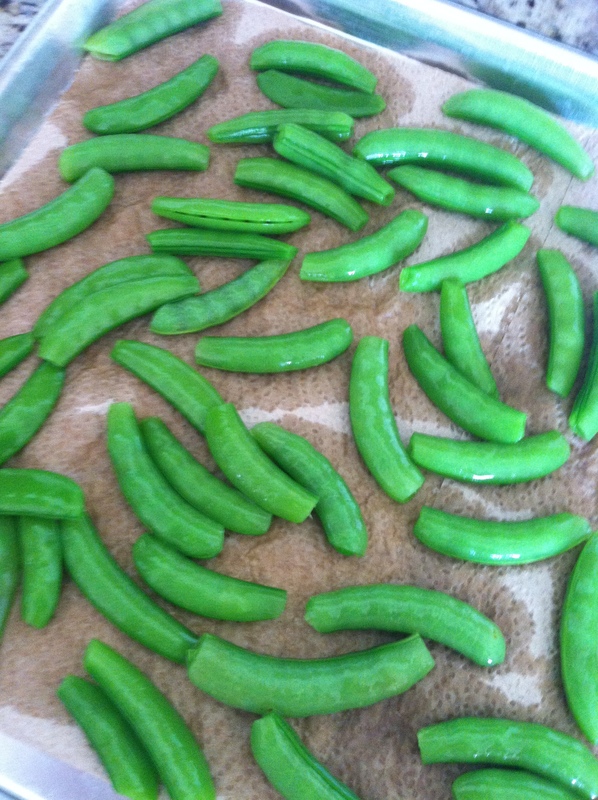 I choose the put them in the freezer on cookie sheets because it will prevent the beans from freezing stuck together. 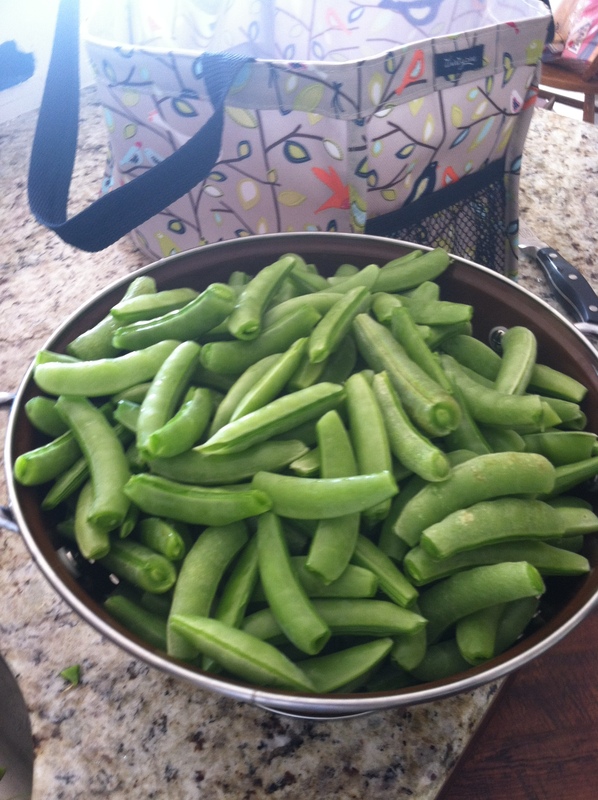 I am so looking forward to using a handful of these summer beans throughout the winter in side dishes or stir fry’s. Next, it was onto the zucchini. I thought I was in the clear with zucchini after the shower. I had sliced the nine zucchini’s I had in my kitchen to serve the crowd. 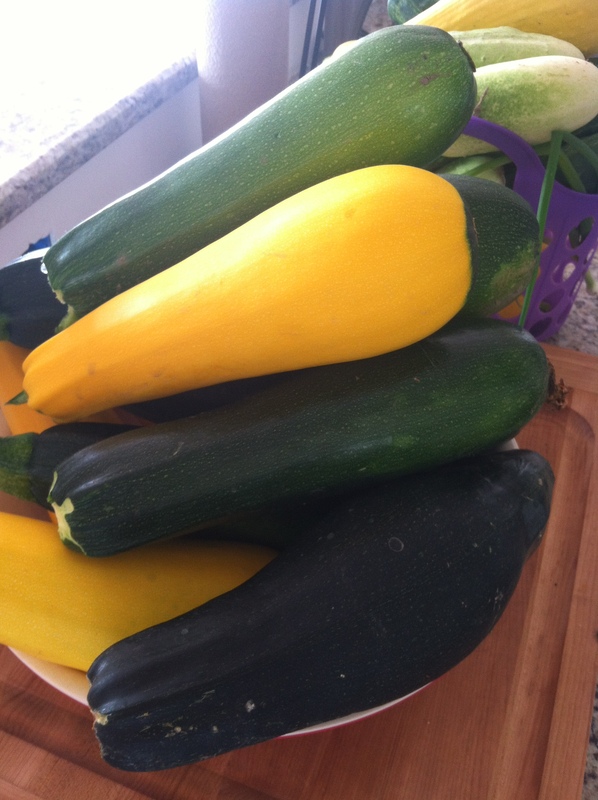 After all that I was certain I wouldn’t have to worry about zucchini for little while. Today- two days later- there were already six on my counter top. 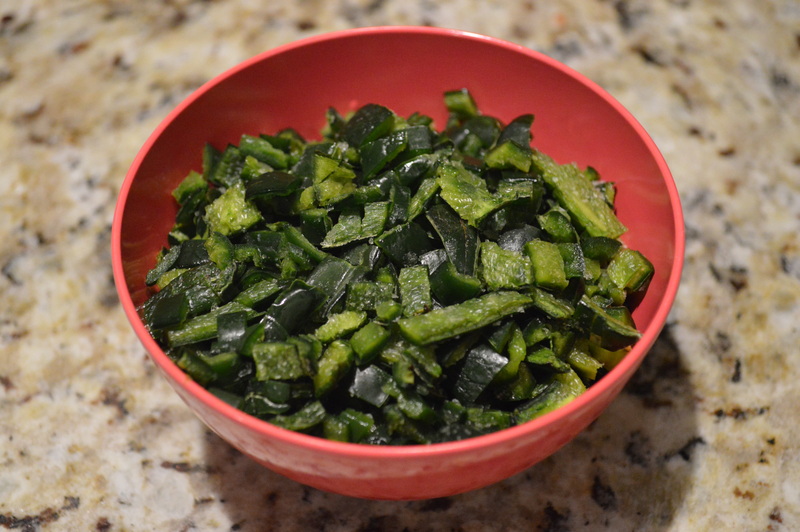 You can blanch sliced or diced zucchini and it is great for stews and casseroles, but my poor little refrigerator ice maker needed to play catch up after the ice bath for all the snap beans. Maybe some other day. 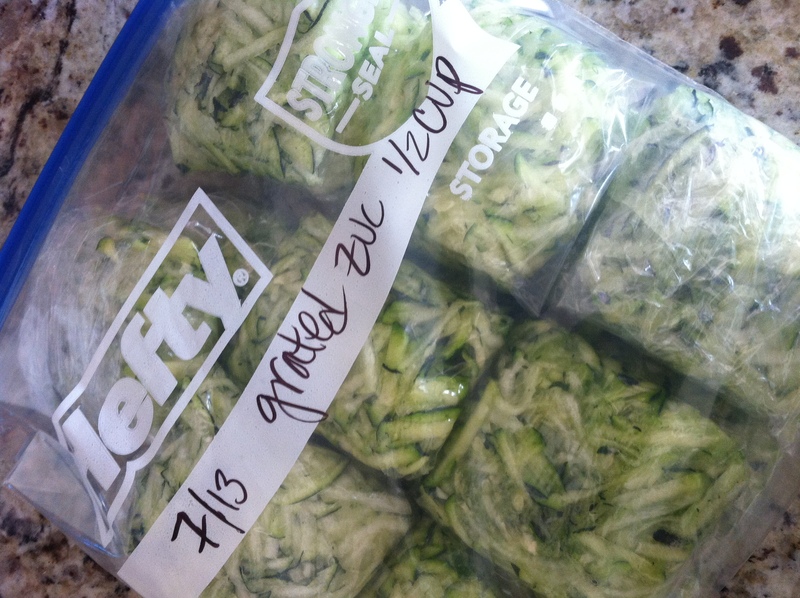 Instead, I grated two zucchini’s and portioned them into ½ cup servings. 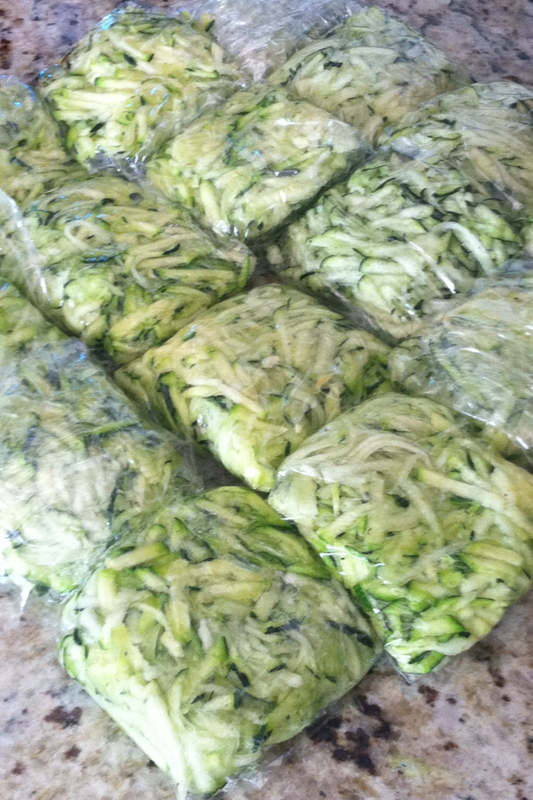 This grated zucchini will be great for all sorts of baked goods, like zucchini cakes or muffins. I put them in half cup portions to make it easy to add to any batter. I was able to get eight cups out of two zucchini’s. All in all, not bad and it really didn’t take too long. Now I can combat that feeling of panic that we will never be able to eat everything by knowing we will be eating from this garden all year long. I already cannot wait to use these frozen items on a day in December, when I am feeling frozen myself, and remember how HOT it was today.